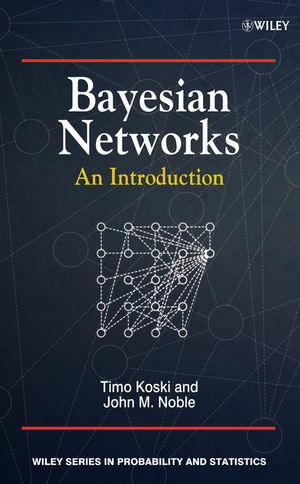 Bayesian Networks: An Introduction provides a self-contained introduction to the theory and applications of Bayesian networks, a topic of interest and importance for statisticians, computer scientists and those involved in modelling complex data sets. The material has been extensively tested in classroom teaching and assumes a basic knowledge of probability, statistics and mathematics. All notions are carefully explained and feature exercises throughout. Timo Koski, Professor of Mathematical Statistics, Department of Mathematics, Royal Institute of Technology, Stockholm, Sweden. John M. Noble, Department of Mathematics, University of Linköping, Sweden. 1 Graphical models and probabilistic reasoning. 1.2 Axioms of probability and basic notations. 1.3 The Bayes update of probability. 1.5 Interpretations of probability and Bayesian networks. 1.6 Learning as inference about parameters. 1.9 Multinomial sampling and the Dirichlet integral. Exercises: Probabilistic theories of causality, Bayes’ rule, multinomial sampling and the Dirichlet density. 2 Conditional independence, graphs and d-separation. 2.3 Directed acyclic graphs and d-separation. 2.7 Object oriented Bayesian networks. 2.8 d-Separation and conditional independence. 2.9 Markov models and Bayesian networks. 2.10 I-maps and Markov equivalence. Exercises: Conditional independence and d-separation. 3 Evidence, sufficiency and Monte Carlo methods. 3.2 Soft evidence and virtual evidence. 3.3 Queries in probabilistic inference. 3.5 Bayesian sufficient statistics and prediction sufficiency. 3.7 A brief introduction to Markov chain Monte Carlo methods. 3.8 The one-dimensional discrete Metropolis algorithm. Exercises: Evidence, sufficiency and Monte Carlo methods. 4 Decomposable graphs and chain graphs. 4.2 Decomposable graphs and triangulation of graphs. 4.5 Markov equivalence, the essential graph and chain graphs. Exercises: Decomposable graphs and chain graphs. 5 Learning the conditional probability potentials. 5.1 Initial illustration: maximum likelihood estimate for a fork connection. 5.2 The maximum likelihood estimator for multinomial sampling. 5.3 MLE for the parameters in a DAG: the general setting. 5.4 Updating, missing data, fractional updating. Exercises: Learning the conditional probability potentials. 6 Learning the graph structure. 6.1 Assigning a probability distribution to the graph structure. 6.2 Markov equivalence and consistency. 6.3 Reducing the size of the search. 6.4 Monte Carlo methods for locating the graph structure. Exercises: Learning the graph structure. 7.1 Changing parameters in a network. 7.2 Measures of divergence between probability distributions. 7.3 The Chan-Darwiche distance measure. 7.4 Parameter changes to satisfy query constraints. 7.5 The sensitivity of queries to parameter changes. 8 Graphical models and exponential families. 8.1 Introduction to exponential families. 8.2 Standard examples of exponential families. 8.3 Graphical models and exponential families. 8.4 Noisy ‘or’ as an exponential family. 8.5 Properties of the log partition function. Exercises: Graphical models and exponential families. 9 Causality and intervention calculus. 9.2 Conditioning by observation and by intervention. 9.3 The intervention calculus for a Bayesian network. 9.4 Properties of intervention calculus. 9.6 A note on the order of ‘see’ and ‘do’ conditioning. 9.7 The ‘Sure Thing’ principle. 9.8 Back door criterion, confounding and identifiability. Exercises: Causality and intervention calculus. 10 The junction tree and probability updating. 10.1 Probability updating using a junction tree. 10.2 Potentials and the distributive law. 10.3 Elimination and domain graphs. 10.4 Factorization along an undirected graph. 10.5 Factorizing along a junction tree. 10.6 Local computation on junction trees. 10.8 Local and global consistency. 10.9 Message passing for conditional Gaussian distributions. 10.10 Using a junction tree with virtual evidence and soft evidence. Exercises: The junction tree and probability updating. 11 Factor graphs and the sum product algorithm. 11.1 Factorization and local potentials. 11.2 The sum product algorithm. 11.3 Detailed illustration of the algorithm. Exercise: Factor graphs and the sum product algorithm.